Provenance at Studio Number One. The piece pictured is the actual original to the Joan Jett Pink and Joan Jett Pop prints. The album cover underneath the stencil is Jefferson Starship's Modern Times. This piece is signed by Shepard on the front in pencil and on the reverse is a special inscription (originally hidden) to his wife, Amanda. 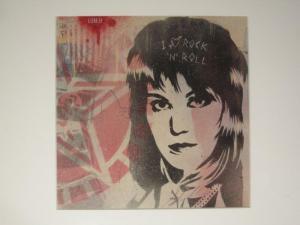 According to Jason Filipow, Shepard handcut the stencil for this piece and painted it on Thanksgiving Day 2002. This was also the first year he started creating Album Cover pieces. Another copy from this edition was originally sold at the Sixspace Gallery show in 2003.